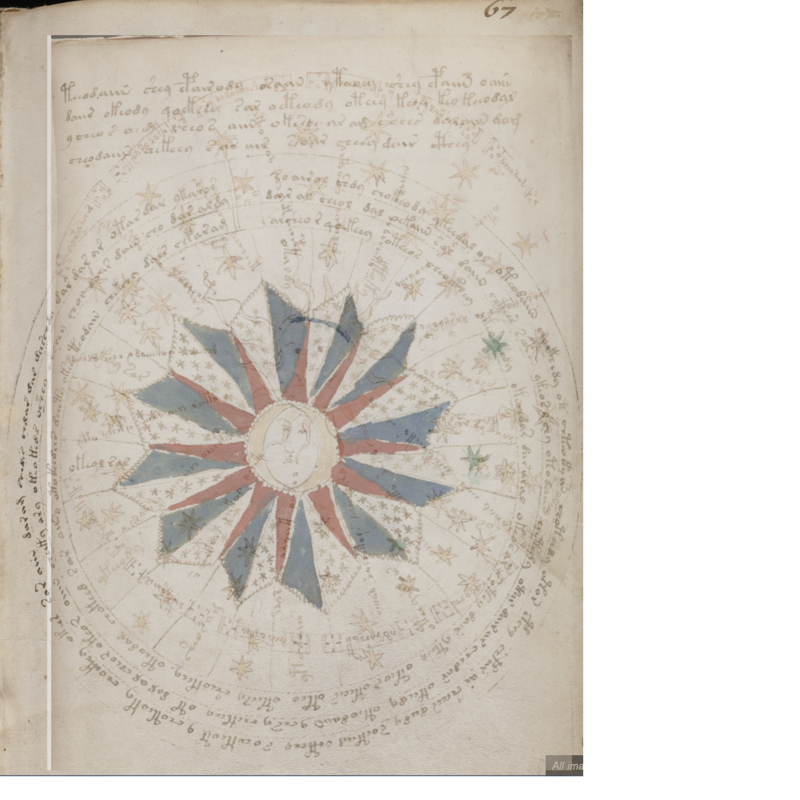 This section is devoted to the astrology/astronomy/ cosmological pages of the Voynich manuscript, to take up suggestions from Marco Ponzi on these pages. See this discussion of the star names in the manuscript. 1. See a page devoted to Voynich f68r (Pleiades page), including some of Marco Ponzi’s suggestions. 3. See also a discussion of f85r2, also with ideas from Marco Ponzi. 4. See also a page devoted to f67r. Thanks – if you know of any more similar manuscripts, feel free to add a comment and I will add them. Is it possible the Voynich Manuscript is a book about aphrodisiac plants? I was thinking the same thing. Since we do have a lot of images of women in various stages, and some possible conception imagery, why not? It may well be that these pages revolve around what to take, when to take it, and when to approach a woman. Indeed forbidden or not to be spoken out loud on just any occasion, I would guess. The suns and the stars depicted in the Voynich represent some core elements of north European mythologies that can be found in Scandinavian, Finno-Ugric, north Germanic, and even to some extent Celtic traditional belief systems. These belief systems go back thousands of years. The abstract sun symbols are sun crosses, selburoses, sun wheels, kolovrats, and other icons found in European mythology. They appear on distaffs, treenware, standing stones, brooches, and other artifacts and have more to do with the divine flow of time as seen by the movement of the stars than the stars themselves. The female sun in the center of many of these star charts is a portrait of the deified ancestor of a north European clan–a member of the idisi. These charts are more genealogical than astronomical. These are more likely to be birkarls, or Kvens, than astronomers. voynichimageryDOTwordpressDOTcom (dateline 22 November 2014). The “big business” blog was the first one by Ellie Velinska, before she moved to a Blogger blog. Credit to her for the find, I think, although another may have preceded her. I wrote a commentary on the green stars too, and certainly found nothing earlier about them by Voynicheros. But of course the key word is ‘found’ – there is no consistent history of Voynich studies, and finding the first comment on a subject is a matter of luck. Amateurs often find it easier to give an impression of originality, and many simply know no better. The term ‘Thurayya’ came from southern India, where it still signifies ‘Victory’, but after it had entered Arabic (very early), an Arabic etymology was created for it namely “water in the ground”, the bedu explaining that it is so called because when the Pleiades were highest in the sky, surface water was scarce and the Arabs had to rely on water rising from underground. However, it is plain that the word is not native to Arabic, and numerous other folk etymologies were created for it. Hinkley Allen for all its flaws remains one of the best among the easily available works on comparative terms, but if you have a mind to research the matter in depth, I’d suggest beginning with Sergeant, David King or David Pingree. 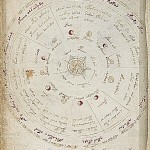 Martin Varisco is another who has written on the topic of almanacs, calendars and star-names. I would not recommend works from the early 20thC German school such as ‘Hamlet’s Mill’ except for general amusement. The most knowledgeable texts of all were by the eastern mariners for their fellows, all men whose navigation by the stars meant they needed not to rely on such aids as magnetic needle, sextant or compass – but as works for professionals by professionals those are pretty dense and they would need a considerable amount of preparatory study to make full sense of them. For the Latin context, or even the Greek, it is useful to keep handy some reference which shows the various (often horrible) errors which we find in instruments and texts purporting to use the ‘Arab’ star-names. The word certainly looks like a broken plural in Arabic, but even early Arab astronomers could not interpret the name. I hadn’t heard the possible Indian connection – which language is it thought to come from? I have referred ‘Marco’ to most of the important of the more easily found works in English. My own study of pre-modern astronomies occupied more than twenty-five years of my working life, though more as a private interest first awakened by the topic for my doctoral thesis. Not easy to condense the background in a weblog post. However, Tamil is the southern Indian language in which the name ‘Thurayya’ remains an element, as in Thuraisingham. On the Bedu’s explanation of the name, and that current among the Arab-and-Persian pilots of the Great Sea, I suppose Tibbett’s translation of Ibn Majid’s Faida is the best place to start for an English speaker. I should add, as caution, that many of the more allusive and poetical passages in that work will be hardly intelligible to a new student of the subject. However, having the time and interest, I found it of great help for my study of the Voynich astro-meteorological folios, and less directly it enabled me to be the first person to show that folio 86v is a world-map, made not according to European style, but of the type we find in the eastern sphere. Cheers. sorry – the Bedu lore is found scattered through various academic papers and some older ethnological studies. One in particular was of assistance to me, though at the moment the chap’s name escapes me. I will have cited him in the relevant post(s) of my exploratory blogs (2008-9) and perhaps on the expositional ‘Voynichimagery’ and ‘Voynich retro’ wordpress blogs. As always, when these points come up, I recommend people contact Mr. Zandbergen, who once said that he always prints out and keeps the information on file from everyone who writes on MS Beinecke 408. I don’t personally approve of that practice, but one cannot prevent it and in time it may prove the wisest course to have maintained such an archive. I attend the moment. Thanks Diane. In relation to your last point, people might like to see your discussion of folio 86v here. You are doing wonderful work, thank you. Thanks, that’s a beautiful picture! What was the basis for dividing the Voynich Manuscript into “quires”? Are there differences in the pages between one quire and the next, or did later observers like us just think it was easier to consider 10 pages at a time? Basically the pages were gathered together into groups. At the end of some of the quires is a marking written at the bottom of the page to show it is the end, e.g. here for quire 8 and here for quire 7. As René saye “It is not clear when or by whom these were written, but they are clearly older than the folio numbers. They are indicated with an old-fashioned numeral followed by a 9 for Latin -us, and sometimes an ‘m’ in between”. I downloaded Voynich manuscript. I saw some useful pages from 70r to 73r. For example 72v “Libra” schematic with a text wrote in bold, but I think it is not Voynich script. What is your opinion? another page 71v last page scheme of “Pisces” or “Hoot” in Arbic. what is the bold title at the middle of page?!! Hello – I am not sure which script you mean? Dear sir, I found special word at page 71r at the middle of circle below Aries image , it wrote “abril” that the time for Aries. of course in the middle of page 72v below Libra sign it wrote “octebir(?!!!)”. I believe that there are not voynich scripts?!! Yes, you are right. These words are not in Voynich script. They are thought to be added later, in some sort of French dialect, with the names of the months, April, October and so on. But because they are not in Voynich script, and were clearly added later, they do not help us to interpret the main text, unfortunately. In page 70r below the Pisces sign, you can see such text: “mang” we can read it as “mahy” too, it is such as Persian word “ماهی” or “fish” in English. in page 71r below the Aries sign this text has written: “abril” it refer to the April. But there is another one in 72r. Below the sign of Libra we can read “octebir(?!!! )” that can much with the October. I think they are very very interesting and brilliant findings. I have read more about the astrology of the 360 degrees of the zodiac (variously referred to as “paranatellonta”, “myriogenesis” or “moirogenesis”, “monomoiriai” or “monomoira”). With respect to the Voynich manuscript, a major difference is that in Firmicus there is a lot of repetition among different signs: almost all signs have one head and one heart (two for Pisces and Gemini) and a variable number of feet. 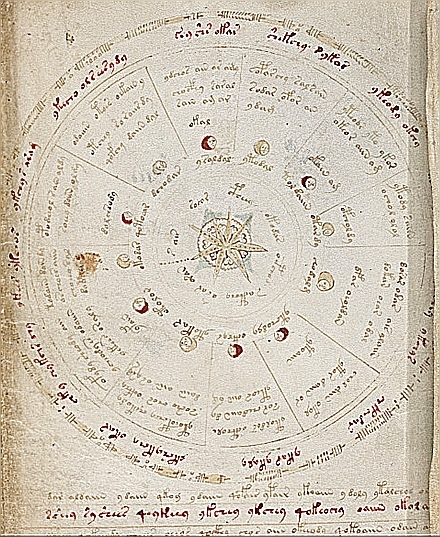 The Voynich ms displays a greater variety of words for the degrees listed in the Zodiac pages. 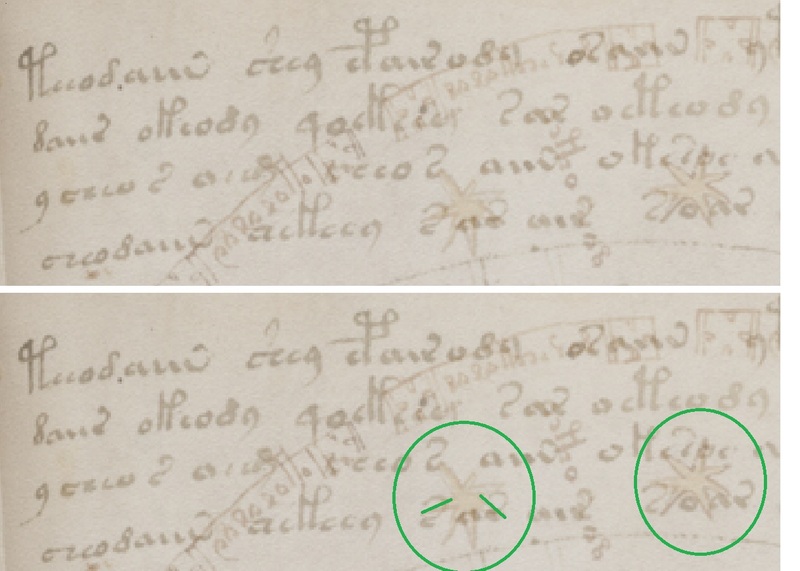 The star corresponding to the knot of Pisces (usually called “Alrescha”) is labeled EVA “otolal” in Voynich f70v2. Could the label possibly read something like “al-afuf” and be related to the Arabic “al afu” and to “remissio”? This idea is just speculative: at the moment, it is not clear to me whether the Book of Hermes has ever been translated into Arabic. The Latin version is thought to be the translation of a lost Greek original and it is considered to be independent from Arabic sources. I guess that more information could be found in “Neue astrologische Texte des Hermes Trismegistos”, Wilhelm Gundel, 1936: the first printed edition of the Latin text. After watching your lecture from April now, I may add that most of the star labels on f68v2 do have EVA:y as last character, may be corresponding to “in the direction of”. First: I am not an expert on the VM. I am however a botanist by training. I stumbled upon this manuscript two weeks ago because I was looking for a picture of one of the plants I am working on at the moment, and someone identified one folio as this plant. I have several ideas about the herbal section, but this needs further work (and I am currently at the last two months of my dissertation, so no can do). For this I have no time to delve into the literature about the VM (and I have frankly no concern about the script or contents of it). Therefore I don’t know if someone else has posted this thought already. When looking at the star section I was struck by the fact that albeit most stars are painted yellow a few are painted green. Of course we have no idea about the intention of this colouration. But what if we assume that the stars painted green are actually visible in green light at the night sky (I hope thats not too farfetched). This is actually quite peculiar because for chemical reason stars can intrinsically not be green. However, there are actually one to few “stars” on the night sky that appear green and are so described in ancient literature (actually they are star systems where a bright red star makes the other stars look green, am not an expert on this). Most of these as far as I can tell are detected with telescopes only and these we can safely rule out for the purpose of finding a name. One star, however, stands out as it was already described as green by ancient authors that is Zubeneschamali, or Beta Librae in modern terms. Being the brightest star in the constellation Libra, maybe it is drawn at several folios. Within libra f72v1: The closest label I found is at 9 o’clock position (or is this on a separate page?) this time EVA:orarol. Unfortunately I cannot see the colour of the star at this position. Unluckily, as you can see from the comments, the origin and dating of the manuscript is not clear. I have extensively but unsuccessfully browsed gallica.bnf.fr searching for the manuscript containing this illustration. I wonder if the “flowers” in the diamonds on the left represent stars (which would make for a more interesting match with 68r1). Thanks Marco – fascinating as always . I wish we could find the origin of this manuscript. The top line is in Arabic. It basically says: ” The Choices of things/matters is determined by the relationship (communication) between the moon and Venus”, so the page is basically a scheme for making ‘Elections’ in life via astrology. Then the top right picture of the musician represents Venus (as the name for the planet is written above it – “sourat alzuhara” = image of Venus), while the picture below represents the Moon (“sourat al mah” = image of the moon, using a Persian word for moon). It is curious that the top line uses the Arabic word for moon (alqamar) whereas the picture caption uses the Persian word. The face of the moon seems Persian/Mongol to me, which fits with the Persian language element. Then the first column of the table, written in red and green, has the twelve signs of the zodiac, starting with Aries at the top, then Taurus (thour) and so on. Some the other headings look Persian to me, and I can’t make out much of the black text in each box – again it looks Persian, but I will ask a friend! The whole thing seems to be a means of calculating the relative positions of the moon and Venus to make certain choices, in the way I discussed in my April talk. This looks very reminiscent to me of some of the Ilkhani Tables, which I am currently studying with the help of an Iranian friend. These tables served to ‘translate’ and compare calendars from various cultures (Persian, Uighur, Chinese and so on). So I do see possible resonances with some of the Voynich pages. Thanks again – a really interesting find. So we were right – it is about ‘Elections’, choices to be made according to astrological phenomena. I’d love to know where it is from! “It is good to travel” etc… may not be astrological, but purely calendrical. We have numerous instances of memorised calendars with mottos for each day – astronomy, meteorology, religious observance, trade patterns etc. all may be included. There’s even one, if I recall, on the Atlas Catala, as a perpetual calendar. I cannot read the text but I thought the musician was Venus as well. It could be Aphrodite with a lyre though. (Aphrodite has epithets too but I’ll spare you the details.) Aphrodite represents the planet Venus. This comes from a manuscript by Qazwini/ Qazwini. To my list of mediaeval herbal manuscripts I have just added a link to another copy of Qazwini’s manuscript (in Arabic this time) which looks interesting = planets, stars and herbs, Persian and Arabic mixing…. a full copy can be seen here. See also this discussion and explanation of the Venus figure. And also this wonderful bowl. thank you very much for clarifying the content of this mysterious page! Thanks also to Marnix for his additional comments on the personification of Venus. Now that I understand more of the content of the text, the analogy with the Voynich manuscript seems to me rather weak. 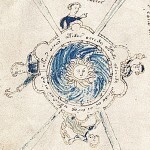 Actually, one of the strange features of the Voynich manuscript is the apparent absence of personifications of the planets (but for the two “luminaries”: the Sun and the Moon). Marco, I agree with you that the lack of personifications of the planets in the Voynich is interesting, but I am more positive than you are about the relevance of this kind of page to the manuscript. In my view several of the V pages could relate to the idea of ‘Election’, i.e. choosing your actions according to elements of astrology. So seeing different examples of similar pages can help us to see how the V might operate. Another curiosity about the page you showed is the fact that it uses the same script for two different languages (Arabic and Persian) together, a warning to us that the V might do the same! I agree about the wonderful Qazwini manuscript – thanks for the full reference. Lots of moons and suns with faces. Did you see the amazing world map? Since I can read nothing of it, I am not sure that the parallel is in any way relevant. Unluckily I could not find any high resolution image. Can you make anything out of the inscriptions? I wonder if they are just the obvious twelve months / zodiac sings ore something more peculiar. The only words I can make out are those in the outer ring, which are the twelve signs of the zodiac. The word at the top, to the left of the black bar, is Jedy (Capricorn). ‘Thaur’ (Taurus) is at the 8 o’clock position, i.e. the fifth one round if you start at Jedi and work anti-clockwise. The second ring matches each sign with the four elements, so the segment below ‘Jedy’ starts with ‘turaab’ = earth, plus some other words I can’t see. then the next segment anticlockwise on the second row has air (plus a few more words), then water and fire in sequence. Then the four repeat again. So ‘thaur’ is also matched with ‘earth’, for example. I’d be interested to read the middle ring, around the rather gloomy-faced sun! I’ll try to see the original in the British Library and let you know. Thanks, as always. Thank you, Stephen! Following your explanation, I think I can see the planetary associations of the twelve signs painted in orange in the inner “diamonds”. The Moon / Cancer association at 5:30 is particularly clear, but also Taurus / Venus is more or less readable. I tried to see the original manuscript at the British Library but it is ‘in use by a staff member’ unfortunately. I notice that it is from ‘Five Arabic Treatises on Alchemy’ and is 18th century, so a bit late for the Voynich, but still interesting as an insight into how this sort of illustration continued in Arabic thought over several centuries, and the fact that it is linked to alchemy. Thanks again Marco. I’ll try to get back and see it in the near future. Thank you, Stephen! I did not notice that the manuscript was so late, I am sorry. expecting to be useful to you. So, you, what do you think about it ? Am I only a dreamer or your conclusions are the same as I ? Personally, I think the truth is more boring than you suggest. I feel the manuscript is simply written in an unknown script and an unknown language. I am sorry to say i can’t see the patterns you have suggested, but that is no reason to stop your investigations. Maybe others have better eyes than I do! I agree graphics’code can be mixed with an unknown script in perhaps an unknown/forgotten language. (unvolontary cut) are missing of lights and colors… and perhaps, despite all evidences i have, I’m wrong. 1) Star1 is preceeded by a space in code. 3) Star1 is followed by a space in code. 4) Star2 is preceeded by a space in code. 6) Star2 is followed by a space in code. I searched the Warburg site for analogues of the Voynich iconography of the zodiac sign. 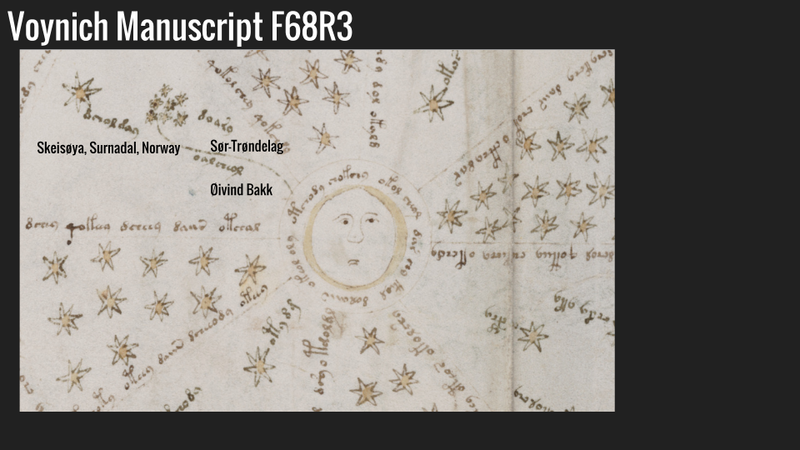 as you pointed out in your paper, the Label of the Pleiades in Voynich f68r3 (EVA “doary”) possibly reads “taurn”, and could be refer to the constellation of Taurus. In footnote 8 you also point out that in Arabic the name of the Pleiades is also similar (“Al Thurayya”). I want to underline again the similarity of that Voynich diagram with diagrams of the Mansions of the moon: not only is the general shape of the diagram similar (with stars radially ordered around a central circle likely), but the position of the Pleiades is also very similar (I marked it A in Voynich and 3 in the Getty ms) [Click here to see the comparison]. I think this is important, because it could provide a specific context for the study of this page. It is likely that this Voynich diagram is related with the mansions of the moon. But above all it is almost certain that this diagram has the typical orientation in which Aries appears at the top. The matches “tebartun”/”debaran” and “akebatu”/”acebata” are not very close. 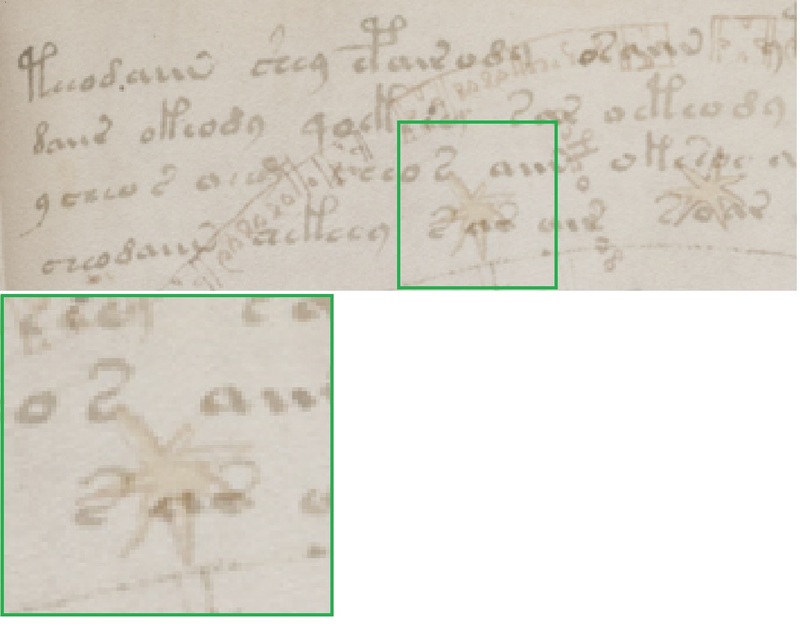 What could possibly make them interesting is the matching of the angular position between Voynich and Getty ms (as well as the similar BNF ms). Thanks Marco, this is really fascinating. I do find the parallels which you suggest intriguing. Your sign-sound mappings are also very interesting. I’ll look into them in the next few days and see if I can find more examples and evidence. This manuscript presents images and Latin names for all the “paranatellonta”, i.e. symbols corresponding to the 360 degrees of the zodiac, possibly related to the nymphs in Voynich Zodiac pages. If I understand correctly, the text is derived from Albumasar’s works. Both the BNF and the Getty manuscript present a mansion of the Moon in Taurus with a group of seven stars. In both diagrams, that mansion is labeled “aldarai” (I must correct the “aldani” of my previous post). D’Imperio gives “Al-Turaija” and “Athoraye”. Does Al Thurrayya mean “the many little ones”? Could you please explain why the association doary/thaur is preferable to the alternative doary/thurayya? Yes, Thurayya is supposed to mean ‘the many little ones’. 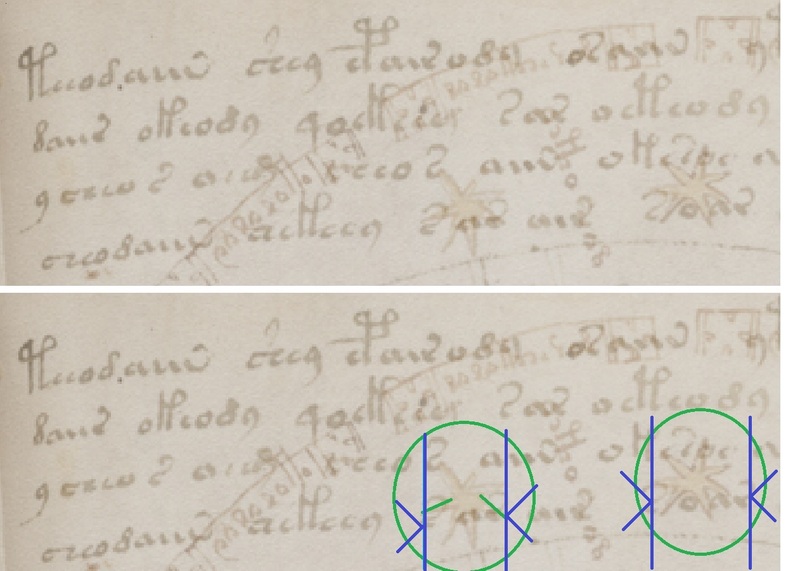 The reason I think that Tawr/Taurus is more likely for the Voynich label is partly the absence of a clear ‘y’ in the voynich word, plus apparently two elements before the ‘r’. Thank you for the clarification, Stephen! The illustration represents the mansions of the Moon, although (as noted by Matthew Dean) it only presents 26 mansions, instead of the usual 28. Thanks Marco. This is a really useful comment because it gives us an alternative series of names for the important stars, to compare with D’Imperio’s list. Does anyone else know any good sources for star names, for example in Persian, Indian languages, Armenian and so on? Or others in Latin or Italian? 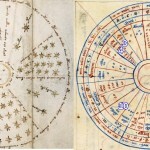 In this case, Libra has a symbol for each one of the 30 degrees of the sign, so the image is more consistent with the illustration in Voynich f72v1 and its 30 “nymphs”. Thank you for the new section, Stephen! I wish I knew more of classical astrology. Many great manuscripts are available online, but understanding their possible relation with the Voynich ms would require specific expertise in the field. The Warburg Institute has many images from a 1379 Italian translation of Alfonso X of Castile “Libros del saber de astronomia” (Book about the science of astronomy) – ms Vat. lat. 8174. 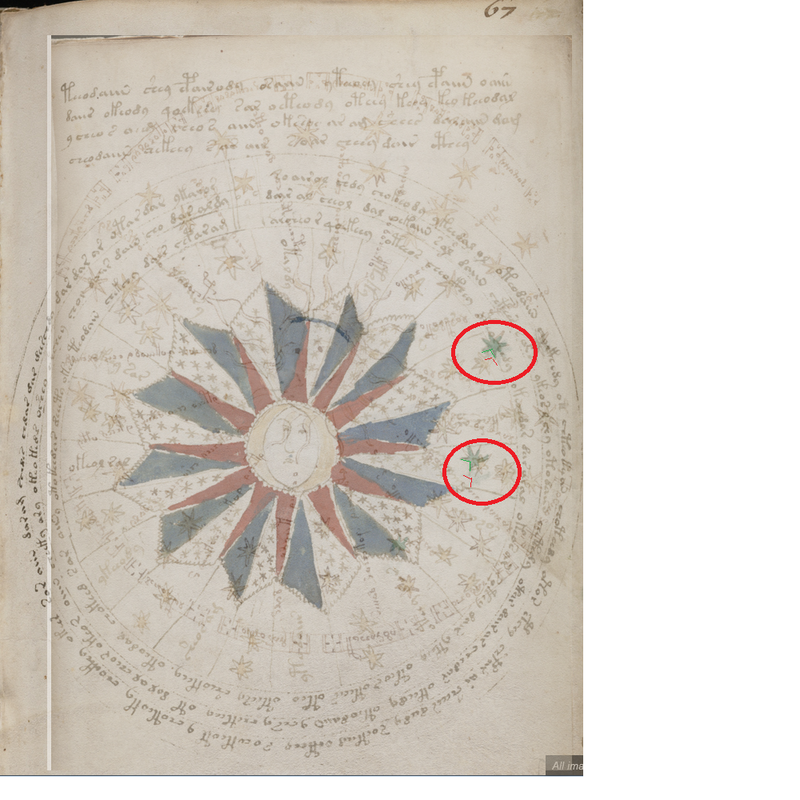 Most of the images have a structure similar to the Voynich astrological tables folio 70 ff: the symbol of a constellation at the center and single stars ordered radially around the center (but in this case the stars are not personified as in the Voynich ms). For instance, the image of Libra. The text in the inner circle divides the stars in four quadrants: North, South, North, South. “Di set [ten] tri on e – Di mez zo di e – Di set ten tri o ne – Di mez zo di e” (what appear to be single short words are actually parts of longer words: “Di settentrione, di mezzodie”). “The brightest of the two which belong to the lower scale is in Scorpio. Its width is 4 degrees and 8 minutes and 0 degrees and 40 minutes. It is of the third size. Its nature is Saturnine and Mercurial. It is cold and dry”. In this manuscript, Libra has 17 stars, while in Voynich it has 30 stars (which most likely correspond to the days of the month).